March 1936 -- (continued) Life membership "so highly". She was conscientious, faithful; sweet? Miss Butler said she had called there three weeks ago. At the Business Session: Minutes of the Feb. Meeting were read and accepted. 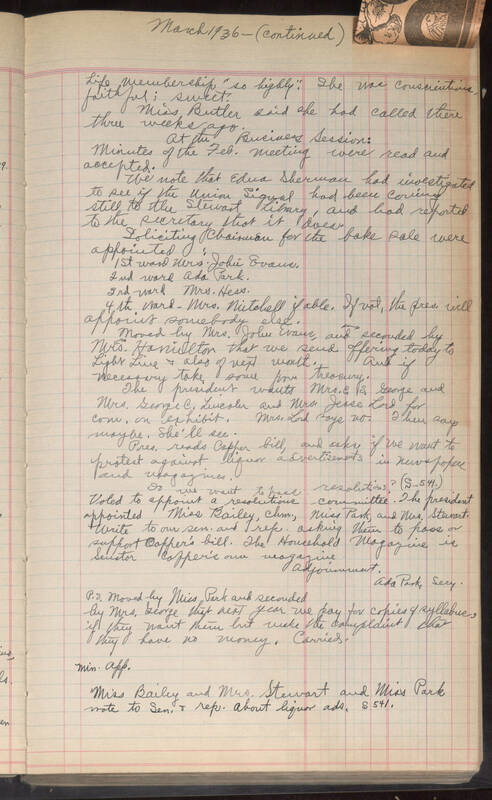 We note that Edna Sherman had investigated to see if the Union Signal had been [calling? caring?] still to the Stewart Library, and had reported to the secretary that it does. Soliciting chairmen for the bake sale were appointed: 1st ward Mrs. John Evans. 2nd ward Ada Park. 3rd ward Mrs. Hess. 4th ward -- Mrs. Mitchell if able. If not, the pres. will appoint somebody else. Moved by Mrs. Hamilton, and seconded by Mrs. John Evans that we send offering today to [Light?] [Line? Live?] + also of next month. And if necessary take some from treasury. The president wants Mrs. [A? C? G?] S. George and Mrs. George C. Lincoln and Mrs. Jesse Lord for com. on exhibit. Mrs. Lord says no. Then says maybe. She'll see. Pres. reads [Capper? Copper?] bill, and asks if we want to protest against liquor advertisements in newspaper and magazines. Do we want to pass resolutions? (S--541.) Voted to appoint a resolutions committee. The president appointed Miss Bailey, chrm., Miss Park, and Mrs. Stewart. Write to our sen. and rep. asking them to pass [or?] support [Copper's?] bill. The Household Magazine is Senator [Copper's?] own magazine. Adjournment. Ada Park, Secy. P.S. Moved by Miss Park and seconded by Mrs. George that next year we pay for copies of syllabus, if they want them but make the complaint that they have no money. Carried. Min. App. Miss Bailey and Mrs. Stewart and Miss Park note to Sen. + rep. about liquor ads. S 541.